Sydney has sunshine and surf, so why did you move to Sweden? Good bloody question. I first came to Sweden in late 1999 as an exchange student from the Sydney Conservatorium of Music, to study classical trumpet with Sir Håkan Hardenberger. I was meant to stay a year but ended up staying for 15. Swedish men are handsome. Actually, I ended up playing too much trumpet and did nerve damage to my upper lip. I tell people I got into a bar fight and broke it that way, but the truth is I just played too many Mahler symphonies. If you are a professional trumpet player but cannot play the trumpet, your knowledge of the Tomasi Trumpet Concerto and the difficulties of Baroque articulation are fairly useless out in the real world, as I discovered. So then I decided to have a breakdown, I met a cute Swedish boy and ended up staying. 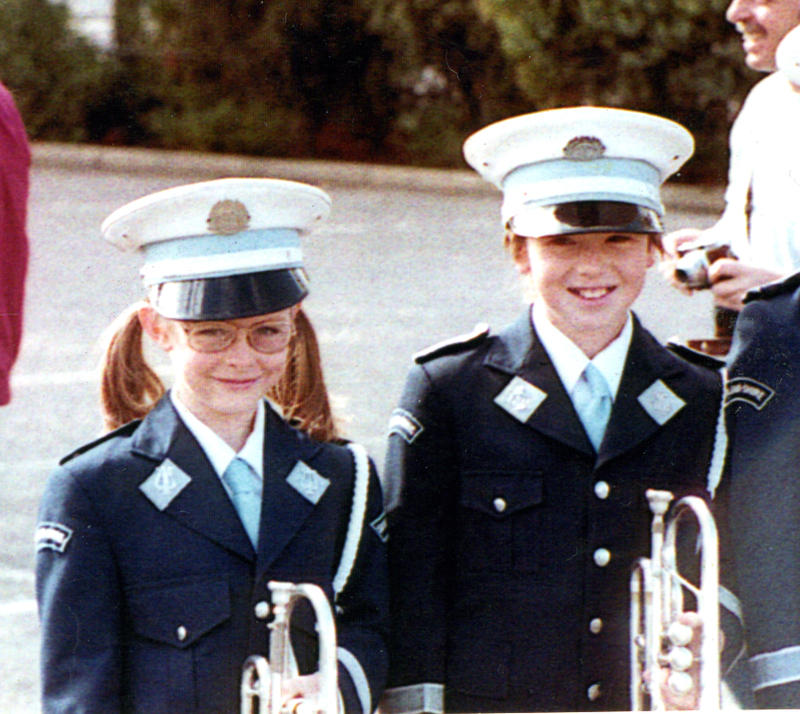 It was very hip being in a brass band in Australia, circa 1984. I closed the lid on my trumpet career a very long time ago and turned to the dark side. I now work as a Marketing Manager. You’ve spent 15 years in Sweden, why isn’t your Swedish any better than it is? You seem to love acronyms, footnotes, exclamation marks and starting sentences with the informal ‘and’, what else do you love? I love my husband (TSH – The Swedish Husband) and baby girls born July 2010 (Bubbaganoush), July 2012 (The Flash) and March 2014 (Surprise Baby). And I love opera, food, rock pools, my Mac and over sharing. I’ve read hilarious posts such as this one from 2012-2014, why did you stop writing? I had a newborn, 1 + 3yr, moved a family of 5 to Sydney, and didn’t have the time. You claim you suffer from fake infertility? You can read about our years of endless IVF treatments in Sweden here, here and here. They never found anything ‘wrong’ with us and were we medically labelled with ‘unexplained infertility’. We were blessed with 2 beautiful daughters and couldn’t be happier. Then, soon after IVF hell, ended up with a spontaneous surprise baby at 38. Obviously, the years of infertility had been quite fake. What else do you suffer from? During 2016 I found a wise old owl allergist in Sydney, Dr. Baker. After 15 years of symptoms and without any doctor in Sweden or Sydney working it out, Dr Baker finally put the pieces of my immunity puzzle together. I’m allergic to waffles. I’m also allergic to dustmites, mould and grass, the latin term for those things combined is what we commonly call ‘air’. oats, oatmeal, rice, rice flour, rye, sorghum grain, sorghum flour, spelt, sugarcane, cane sugar, raw sugar, molasses, teff, triticale, wheat, wheat bran, bulgur, wheat flour, wheat gluten, graham, whole wheat, wheat germ, wild rice, bamboo shoots, barley, barley malt, maltose (from Barley), corn, maize (corn), corn meal, corn oil, cornstarch, corn sugar, corn syrup, hominy grits, popcorn, sweet corn, kamut, lemongrass, citronella and millet. Should we feel sorry for you? But you didn’t mention your dancing talents!!! What about as well as studying classical ballet at the academy with Fabulous Rachael?? Luvvvv your bloggy thingy..
Oh yes my Bachelor of Grand Plié, how could I forget? & I can tell i’m going to love you! Oh thank you so much, welcome onboard! What a lovely blog. It’s great to read something from a fellow Australian in Sweden! Great about page. I grew up in the Salvation Army, so I am a fan of all brass instruments. I only ever played Baritone, rather poorly, but my five older brothers all played reasonably well. Well you could have been an entire brass band it sounds like! Go the Baritone! You’re too funny my Lou Lou 🙂 Its been too long since we caught up properly but I feel I am getting to understand where you are at in life now through your blog – its actually really lovely! Thank you!!!!! I’ll call you soon after I’m out of the jet lag cave!! !